This edition of Profiles was a repeat of the December 29, 2006 show. Steve was at a retirement party in his honor, after puting in many years of service as an editor at the Connecticut Post ( formerly Bridgeport Post). 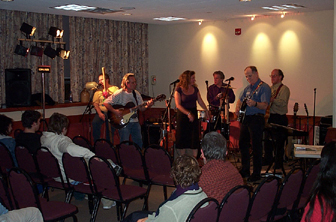 The Blue lights, Formerly Washboard Slim and The Blue Lights Joined Host Steve Winters for an evening of jug band music in front of a live audiance at Sacred Heart University.